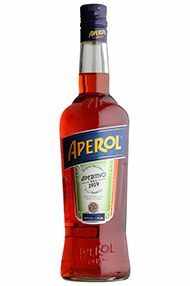 Aperol's unique flavour and colour is achieved through a subtle blend of bitter orange, gentian, rhubarb and an array of herbs and roots - using a secret recipe that has been unchanged since its first creation in 1919. Aperol was founded in 1919 by the Barbieri Company which was based in Padua, west of Venice. However, it was not until after the Second World War that Aperol became popular all over Italy. In 1950, the famous Aperol Spritz was created by mixing three parts Prosecco, two parts Aperol and a splash of soda together. This was also the time of its first television commercial, known as ‘Il Carosello’. During the 80s, Aperol spread internationally and became more diverse and creative as a company. In recent years, Gruppo Campari has taken over ownership of the brand, with more focus on advertising through art, fashion and lifestyle, with great success around the world.